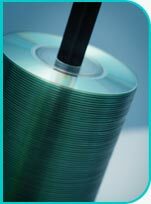 Using out high-end equipment, we can duplicate multiple copies of any CD or DVD in whole for you*. Our high-volume robot will turn around your job quickly and accurately. The discs are imprinted with B&W or full-color design. Printed inserts of your own design is an option you can select.